The City of Vincent has given in principle support for a new public piazza space on the corner of Mary Street and Beaufort Street. Click on the link above for an initial artist’s impression. The City wants to engage with local residents and businesses on the idea. They would also like to trial a “Pop Up Piazza’ for 2 weeks to test how the space would affect traffic movements and car parking. Find out more about the ‘Pop Up Community Piazza’ here – http://betterbeaufort.com.au/pop-up-piazza-on-mary-street/. More news on this exciting new project soon. 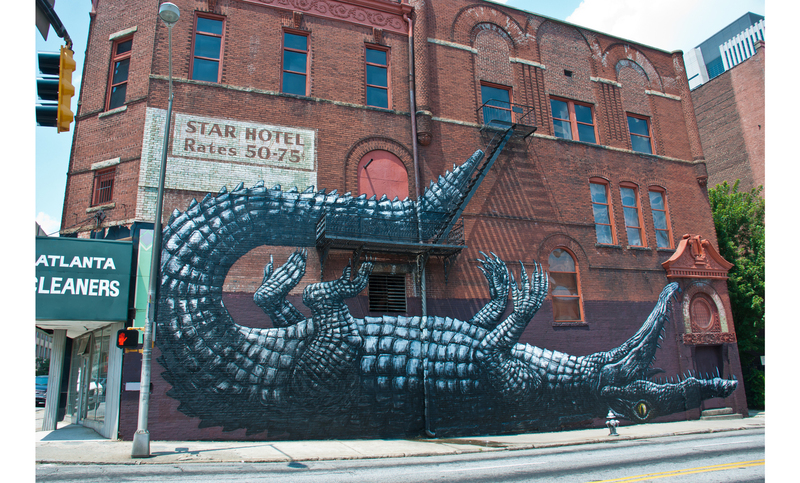 Atlanta, Georgia isn’t usually rated amongst the coolest places to visit. But local Georgians are changing that view themselves. 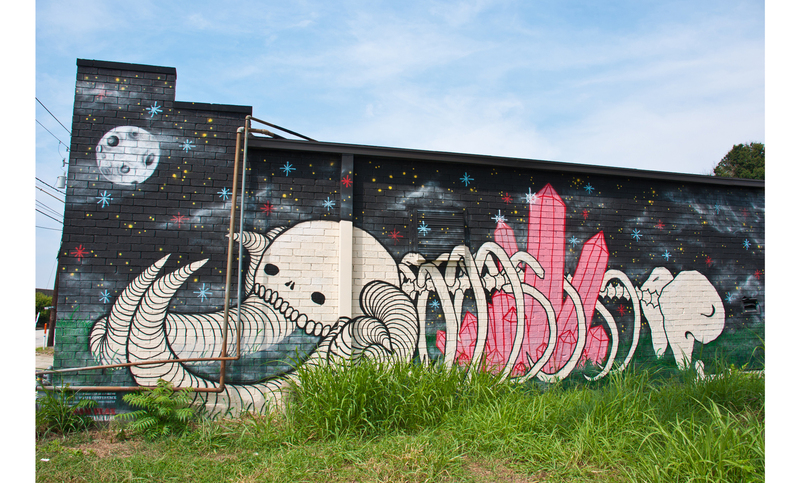 They invited over 100 international artists to brighten up dead spaces through fantastic street murals. Locals also started a new Instagram hashtag – #weloveatl – and were amazed with what happened next. This is just one of the inspirational stories of locals taking charge to improve their own places. This is the key idea behind the Better Beaufort Action Plan – http://betterbeaufort.com.au/better-beaufort-action-plan/. The Network has developed a plan for a Better Beaufort Street. It’s already a great place, but it could be even better. Lots of small actions can make a big difference. While streets were once a place where we stopped for conversation and children played, they are now the exclusive domain of cars. Even where sidewalks are present along highways and high-speed streets, they feel inhospitable and out of place. Traffic and road capacity are not the inevitable result of growth. They are the product of very deliberate choices that have been made to shape our communities around the private automobile. We have the ability to make different choices–starting with the decision to design our streets as comfortable places for people. Thankfully, in recent years a growing number of people around the world have stood up and demanded something better. PPS is helping to show the way forward, assisting communities realize a different vision of what transportation can be. Downtown streets can become destinations worth visiting, not just thruways to and from the workplace. Transit stops and stations can make commuting by rail or bus a pleasure. Neighborhood streets can be places where parents feel safe letting their children play, and commercial strips can be designed as grand boulevards, safe for walking and cycling and allowing for both through and local traffic. We are poised to create a future where priority is given to the appropriate mode, whether pedestrian, bicycle, transit or automobile. To be sure, cars have their place, but the rediscovered importance of walking and “alternative transportation modes” will bring more people out onto the streets—allowing these spaces to serve as public forums where neighbors and friends can connect with one another. Whereas freeways should remain high-speed to accommodate regional mobility, speeds on other roads need to reflect that these are places for people, not just conduits for cars. Desired speeds can be attained with a number of design tools, including changes in roadway widths, curvature, and intersection design. Roadside strategies, like building setbacks and sidewalk activity, can also impact the speed at which motorist comfortably drive. Speed kills sense of place. Cities and town centers are destinations, not raceways, and commerce needs foot traffic. You can’t buy a dress from a car. Even foot traffic speeds up in the presence of fast-moving vehicles. Access, not automobiles, should be the priority in city centers. Don’t ban cars, but remove the presumption in their favor. People first! Communities need to first envision what kinds of places and interactions they want to support, and then plan a transportation system consistent with this collective community vision. Transportation is a means for accomplishing important goals—like economic productivity and social engagement—not an end in itself. Great transportation facilities, such as Grand Central Terminal in New York City and the wide sidewalks of the Champs Elysées, are transportation “improvements” that have truly improved the public realm. Designing road projects to fit community contexts can help increase developable land, create open space, and reconnect communities to their neighbors, a waterfront, or park. They can reduce household dependency on the automobile, allowing children to walk to school, connecting commercial districts to downtowns, and helping build healthier lifestyles by increasing the potential to walk or cycle. Think public benefit, not just private convenience. For years we’ve seen this philosophy gain traction in leading cities around the world. Barcelona has built boulevards and Ramblas that give pedestrians priority over the auto. Paris has developed a neighborhood traffic calming program to rival that of any city anywhere. London charges congestion fees for vehicles entering the city center, successfully reducing traffic levels and funding an aggressive program to improve transit. Bogotá now boasts a world-class bus rapid transit system and has established a mandate to eliminate private auto use during the morning rush hour by 2015. These projects provide evidence that can redesign our transportation networks to reflect their true importance as public spaces and supporters of our vision for our towns and cities. It is also essential to foster land use planning at the community level that supports, instead of overloads, the transportation network. This includes creating more attractive places that people will want to visit in both new and existing developments. A strong sense of place benefits the overall transportation system. Great Places—popular spots with a good mix of people and activities, which can be comfortably reached by foot, bike and perhaps transit as well as cars—put little strain on the transportation system. Poor land use planning, by contrast, generates thousands of unnecessary vehicle-trips, creating dysfunctional roads, which further deteriorate the quality of the places. Transportation professionals can no longer pretend that land use is not their business. Transportation projects that were not integrated with land use planning have created too many negative impacts to ignore. The road, the parking lot, the transit terminal—these places can serve more than one mode (cars) and more than one purpose (movement). Sidewalks are the urban arterials of cities—make them wide, well lit, stylish and accommodating with benches, outdoor cafes and public art. Roads can be shared spaces with pedestrian refuges, bike lanes, and on-street parking. Parking lots can become public markets on weekends. Even major urban arterials can be designed to provide for dedicated bus lanes, well-designed bus stops that serve as gathering places, and multi-modal facilities for bus rapid transit or other forms of travel. Roads are places too! Transportation—the process of going to a place—can be wonderful if we rethink the idea of transportation itself. If we remember that transportation is the journey, but enhancing the community is always our goal. PPS has identified ten qualities that, in conjunction with the principles described above, contribute to the success of great streets. • Attractions & Destinations. Having something to do gives people a reason to come to a place—and to return again and again. When there is nothing to do, a space will remain empty, which can lead to other problems. In planning attractions and destinations, it is important to consider a wide range of activities for: men and women, people of different ages, different times of day, week and year, and for people alone and in groups. Create an enticing path by linking together this variety of experiences. • Identity & Image. Whether a space has a good image and identity is key to its success. Creating a positive image requires keeping a place clean and well-maintained, as well as fostering a sense of identity. This identity can originate in showcasing local assets. Businesses, pedestrians, and driver will then elevate their behavior to this vision and sense of place. • Active Edge Uses. Buildings bases should be human-scaled and allow for interaction between indoors and out. Preferably, there are active ground floor uses that create valuable experiences along a street for both pedestrians and motorists. For instance, a row of shops along a street is more interesting and generally safer to walk by than a blank wall or empty lot. Sidewalk activity also serves to slow vehicular traffic. At the very minimum, the edge connection should be visual, allowing passers-by to enjoy the activity and aesthetics of the indoor space. These edge uses should be active year-round and unite both sides of the street. • Amenities. Successful streets provide amenities to support a variety of activities. These include attractive waste receptacles to maintain cleanliness, street lighting to enhance safety, bicycle racks, and both private and public seating options—the importance of giving people the choice to sit where they want is generally underestimated. Cluster street amenities to support their use. • Management. An active entity that manages the space is central to a street’s success. This requires not only keeping the space clean and safe, but also managing tenants and programming the space to generate daily activity. Events can run the gamut from small street performances to sidewalk sales to cultural, civic or seasonal celebrations. • Seasonal Strategies. In places without a strong management presence or variety of activities, it is often difficult to attract people year-round. Utilize seasonal strategies, like holiday markets, parades and recreational activities to activate the street during all times of the year. If a street offers a unique and attractive experience, weather is often less of a factor than people initially assume. • Diverse User Groups. As mentioned previously, it is essential to provide activities for different groups. Mixing people of different race, gender, age, and income level ensures that no one group dominates the space and makes others feel unwelcome and out of place. • Traffic, Transit & the Pedestrian. A successful street is easy to get to and get through; it is visible both from a distance and up close. Accessible spaces have high parking turnover and, ideally, are convenient to public transit and support walking and biking. Access and linkages to surrounding destinations must be a part of the planning process. Automobile traffic cannot dominate the space and preclude the comfort of other modes. This is generally accomplished by slowing speeds and sharing street space with a range of transportation options. • Blending of Uses and Modes. Ground floor uses and retail activities should spill out into the sidewalks and streets to blur the distinction between public and private space. Shared street space also communicates that no one mode of transportation dominates. • Neighborhood Preservation. Great streets support the context around them. There should be clear transitions from commercial streets to nearby residential neighborhoods, communicating a change in surroundings with a concomitant change in street character. Pam Herron, Chair of the Network and Dean Cracknell will be presenting to the Perth Green Drinks event on Wed 26 March 2014. We’ll be talking about what us happening on Beaufort Street and ideas for creating a better place. How: You need to register for the event. Registrations are FREE. Left of Central is a great placemaking event you should check out. From March 24 to April 11, Museum Street in Northbridge will transform into a fiesta of music, food, movies and creative activity! Throughout the three week celebration, Left of Central will be showcasing student talent and will provide Central staff, students and the public with the opportunity to experiment with the street and enjoy a vibrant, engaging space. A place with things to do, eat, drink, hear and see. It all kicks off with our huge Left of Central Launch Party on Tue 25 March 2014, an evening of entertainment, markets, music and cuisine to celebrate arts in the city. Get involved and help us make Museum Street a place to stop, not drive through! Need some shiny new bike accessories? Want to sell some bike-related stuff? A Bike Swamp Meet is coming to Beaufort Street. Come down and check it out.